Story copyright © 1996 Aaron Shepard. Script copyright © 1996, 2002, 2006, 2007 Aaron Shepard. Scripts in this series are free and may be copied, shared, and performed for any noncommercial purpose, except they may not be posted online without permission. PREVIEW: A young man faces an ancient one in a contest of magic. I find my power in a chant. I win my magic from a song. But can I find a woman’s warmth? And can I win a maiden’s love? NARRATOR 1: as his sleigh ran over the marsh, sped along the lake. NARRATOR 6: The wind blew his beard, the summer sun warmed him. NARRATOR 2: Around the bend another sleigh raced, full speed down the trail the young man pressed. NARRATOR 5: No time to stop, no time to turn aside. NARRATOR 4: the sleighs collided. NARRATOR 3: The drivers nearly tumbled out. NARRATOR 1: Astonished, they eyed each other, waited for words. NARRATOR 6: The horses dripped sweat, pawed the ground. NARRATOR 2: . . . said Vainamoinen. JOUKAHAINEN: (arrogantly) I am Joukahainen. NARRATOR 5: . . . said the youth. VAINAMOINEN: I am Vainamoinen. Now move your sleigh and let me by, for youth must ever give way to age. JOUKAHAINEN: That was in a time long past. Age must now make way for youth, for the young know more than the old! VAINAMOINEN: (scoffing) Is this true? Say what you know, then. Share this great knowledge! JOUKAHAINEN: (bragging) Yes, I know a thing or two. I know the fire is on the hearth, and the smoke hole near the ceiling. A plow in the south is pulled by horse, and in the north by reindeer. The pike feeds on salmon and lays its eggs when frost arrives. VAINAMOINEN: (scornfully) An infant knows as much! What else can you offer? JOUKAHAINEN: (less confidently) Iron comes from ore, copper from the rock. Water is born from the mountains, fire from the heavens. The titmouse was the first of birds, the willow the first of trees. VAINAMOINEN: A toddler has such wisdom! Can you furnish nothing better? JOUKAHAINEN: (anxiously) Back in the beginning, the seas were dug out, and the mountains piled high. The pillars of the sky were erected, and the rainbow raised. The sun and moon were set on their paths, and the stars scattered in the sky. VAINAMOINEN: Know yourself a fool. For I dug out the seas, and I piled high the mountains. I stood among the seven heroes who erected the pillars of the sky and raised the rainbow. And when that was done, we set the sun and moon on their paths and scattered the stars in the heavens. JOUKAHAINEN: (agitated) If my knowledge does not impress you, my sword may do better. Old man, draw your blade! VAINAMOINEN: My sword stays where it is. I would not dirty it on you. JOUKAHAINEN: (shouting) You won’t fight? Then I’ll use great magic on you! I’ll chant you to a pig, change you to a swine. After that, I’ll strike you dead, throw you on a dunghill! NARRATOR 1: Then Vainamoinen grew angry. NARRATOR 6: He began to chant. NARRATOR 2: The earth shook, the sky rumbled. NARRATOR 5: Water splashed from the lake, the stones cracked. NARRATOR 5: and the sword of Joukahainen became lightning bolts across the sky. NARRATOR 1: His crossbow turned to a rainbow over the lake, his arrows to hawks overhead. NARRATOR 2: and the sleigh of Joukahainen became a log in the water. NARRATOR 6: His horse turned to a boulder on the shore, his whip to a reed on the bank. NARRATOR 5: and the coat of Joukahainen became a cloud in the sky. NARRATOR 1: His hat turned to a water lily on the lake, his belt to a snake among the reeds. NARRATOR 6: up to his waist in the swallowing earth. JOUKAHAINEN: (desperately) Reverse your words, undo your spells! I will give you a hat full of silver, a helmet full of gold! NARRATOR 6: and Joukahainen sank to his chest. JOUKAHAINEN: (more desperately) Reverse your words, undo your spells! I will give you fields for plowing, meadows for pasture! NARRATOR 1: and Joukahainen sank to his chin. JOUKAHAINEN: (most desperately) Reverse your words, undo your spells! I will tell you of the fairest woman, the finest maiden! NARRATOR 3: Vainamoinen stopped his chant. JOUKAHAINEN: She is lovely Aila, maiden of Northland, daughter of age-old Louhi. She’s called a blossom sweet to smell, a fruit ripe to pluck. Her fame spreads far, the suitors gather. But no proposal has she smiled on, no suitor given the nod. NARRATOR 4: Then Vainamoinen chanted again. NARRATOR 2: He reversed his words, undid his spells. NARRATOR 5: Joukahainen rose from the marshy ground, up from the swallowing earth. NARRATOR 1: The cloud became again his coat. NARRATOR 6: The water lily turned back to a hat, the snake to a belt. NARRATOR 2: The log became again his sleigh. NARRATOR 5: The boulder turned back to a horse, the reed to a whip. NARRATOR 3: The lightning became again his sword. 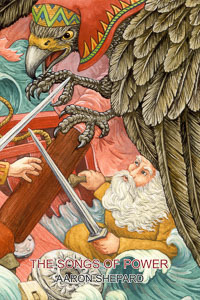 NARRATOR 4: The rainbow turned back to a crossbow, the hawks to arrows. NARRATOR 1: The young man wept in shame. NARRATOR 6: The old man raced for home.